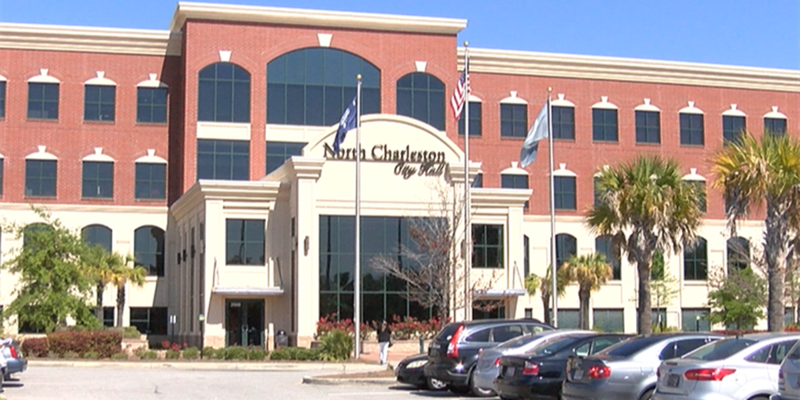 NORTH CHARLESTON, SC (WCSC) - A decision is pending on whether a North Charleston police officer's recent demotion following a complaint of racial bias will be overturned. Officer David Winslette, 38, was demoted March 2, according to documents Live 5 News obtained from a North Charleston Police Department internal investigation. The claim of racial bias is tied to a parody of the song, "What Does the Fox Say?" Winslette met with officials Wednesday morning for a grievance hearing behind closed doors at North Charleston City Hall. Documents show on January 10, 2014 Winslette sent a YouTube link to the former group "Da Chas Thug Life". "I don't remember the specific link or a message," Winslette said in February 9 interview. Winslette met with members of the Professional Standards Bureau February 9, 2017 to discuss the investigation. The interview was recorded. Department documents show the investigation came about after leaders with NCPD received a complaint from Charleston County Solicitor Scarlett Wilson. Her office, along with the State Law Enforcement Division, investigation into the Facebook account of "Chas Thug Life" and his "opinionated comments regarding the solicitor". The investigation revealed private Facebook messages between the group and Winslette in 2013 and 2014. Winslette's message under investigation said, "You guys have probably seen this, but if not, it's quite entertaining. Kind of touches on the recent events." The video link attached is to a parody of the song "What Does the Fox Say?" but titled "What Does the Black Say?" "I know the link, I know the song, but I don't know what I was eluding to," Winslette said in the interview. The video references several racial stereotypes, especially stereotypes of the black community. It makes fun of Africans Americans and some of the depictions include the use of the "N" word, a "Pow Pow" phrase which follows with an image of a man shooting a gun, they smoke crack, they rob people, etc. "Do you see where they could have some concerns about a video like this?" a member of the Professional Standards Bureau asked Winslette in the interview. "I do," Winslette replied. In a statement by Winslette as part of the investigation, he said he wasn't sure what he was eluding to when he sent the video in 2014. "As far as the video, at the time, I must have considered it to be entertaining. It doesn't mean that I believe or endorse what was said or acted out. As I told Captain Johnson and Lieutenant Hardee, I do joke and play with everyone, regardless of race, ethnicity or sexual orientation; and yes, some of the jokes may be inappropriate, but never malicious." On March 2, Winslette was notified of his demotion from Patrolman First Class to Community Service Officer. Officer Winslette posted the comment “You guys may have probably seen this, but if not, it’s quite entertaining. Kind of touches on recent events.” The comment is not specific as to the nature of the video, nor does it express any personal feeling regarding the video; other than being “Entertaining”. The mere fact that Officer Winslette sent the video link does not in itself prove or show racial bias. Officer Winslette has no prior reported complaints of racial bias against him during this tenure as police officer with North Charleston Police Department. In 2012, Winslette was shot in the line of duty while responding to a robbery, where he was later presented the Purple Heart Award; Winslette was hired December of 2010. Documents state Solicitor Wilson filed a complaint because of concern for his ability to effectively testify in court based on the content of the video. Messages for comment from the Solicitor's office was not immediately returned.